You’ve probably seen the signs and gotten the emails about preparing for the new school year. It’s already here! From new hair styles to new clothes, back to school time often means shopping. Spending your money at local shops and salons not only helps the local economy, it also means you will stand out in the crowd with one of a kind items you can’t find at national store chains. Ashton House is stocked with clothing, shoes, accessories and more for back to school shopping. They carry brands such as Yellow Box, Reef, Cowgirl Jewels, Baby Deer, Squeakers and many more. Ashton House has a huge selection of the brand Sugar Booger. The cute and sassy line includes lunch boxes, lunch sacks, snack containers, reuse-able snack bags, silverware sets, backpacks and drink containers. Lots of different prints to choose from. Start back to school time with something from the colorful Lilly Pulitzer collection! These beautiful prints and patterns never go out of style. Bella Bella has LP dresses and accessories for ladies and girls. Bella Bella carries other brands such as Betsey Johnson, Laundry, ABS, Sue Wong, Muse, WWW Collection, Teri Jon, Kay Unger and Kay Celine. When you aren’t sure how to put together an outfit, Ella + Scott is your place. The employees know how to style classic outfits for girls and women of all ages. Ella + Scott has a great selection of scarfs, jeans, shirts, skirts and earrings! You can bet there is always a cute and trendy denim button up in stock! 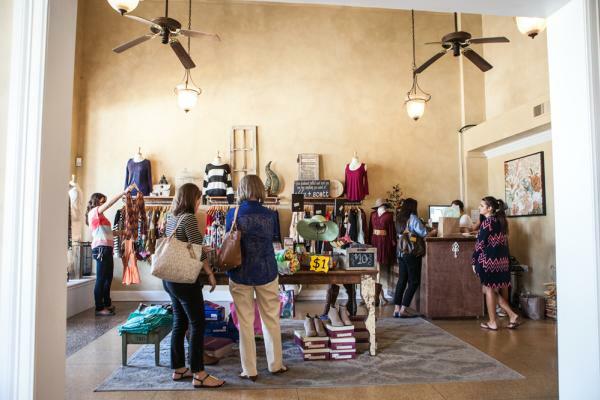 The shop is set in a beautiful, historic building and offers a touch of elegance in a fun atmosphere. Gaudie and Co. is known for creating an exciting shopping experience. They go above and beyond to make the customer feel great and will even special order items for you if you can’t find what you are looking for in the store. Gaudie has designer clothing, shoes, jewelry and other accessories. The Jon Hart backpack and lunch kit are a hot back to school item right now! 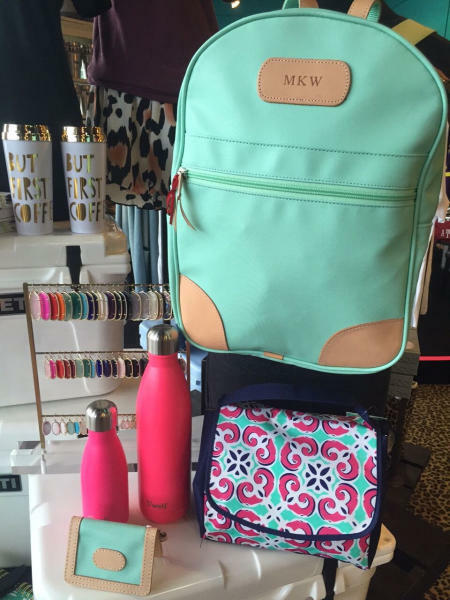 As always Gaudie has the latest selection of Kendra Scott, Swell water bottles and ID wallets. Heartfield Designs is a Beaumont classic. You can get just about anything from backpacks to lunch sacks and even bows monogrammed for back to school! They also offer the finest selection of Sterling Silver, Engraving, Unique Gifts, and Custom Designed Jewelry. 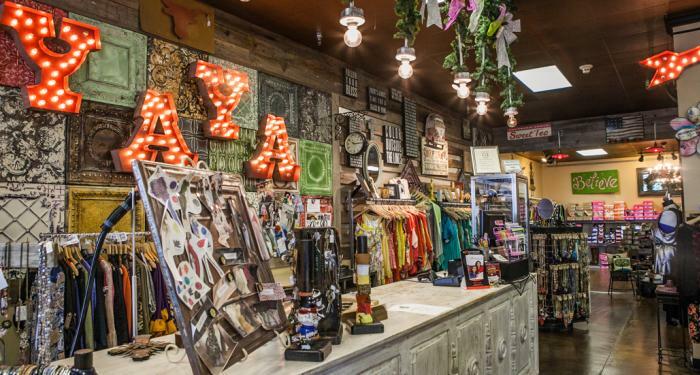 Ya Ya Club has one goal - Fill Southern women’s closets with fabulous clothing! They have cute graphic t-shirts, comfy tops, casual pants and other unique accessories. Ya Ya also carries adorable dresses for work or school. When it is time to unwind from the stress of back to school shopping and preparations, you have plenty of options in Beaumont. Located inside the MCM Elegante Hotel, the Getaway Day Spa offers a variety of massages including: Swedish, deep tissue, hot stone, prenatal and chair massages. 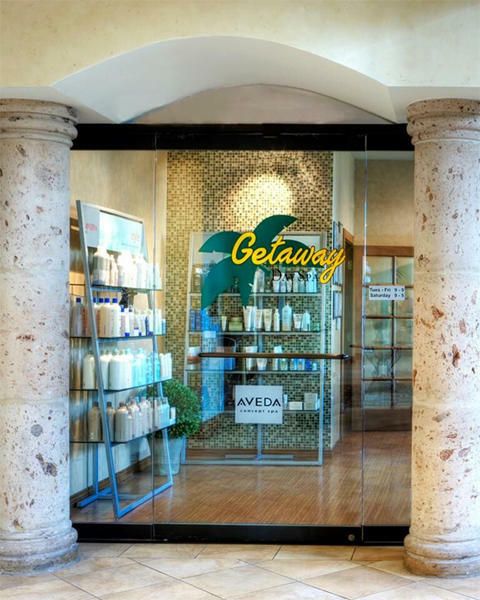 Getaway also uses Eminence products and specializes in body treatments such as scrubs, facials and waxing. Cosmetic services include Infinity Sun spray tanning, manicures & pedicures and professional makeup application with Glo Minerals products. On Stage has two locations in Beaumont where you can pamper yourself and enjoy an afternoon of relaxation. 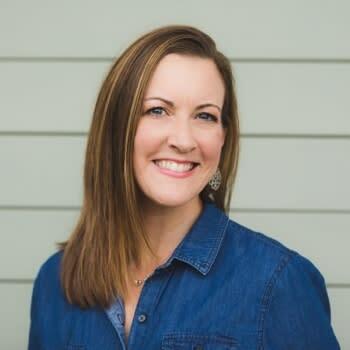 They are known for having great hair stylists, but On Stage also has a great team of experts to provide manicures, pedicures, hot stone massages, facials and more. They’ve even got a 17 jet therapeutic shower for after your massage. Spa Package examples include: The Premier Package: includes spa manicure, glycol custom facial, deep conditioner, shampoo and style for $145. The Blockbuster Package includes a Swedish body massage, spa manicure and a spa pedicure for $135. Solutions Day Spa offers a variety of massages including: Swedish, deep tissue, firm relaxation, hot stone, pregnancy, lymphatic drainage, and intuitive journey. The spa also provides a large line of facial treatments. These include: express, customized, acne, anti-aging, hot stone, dermatological and galvanic current facials. Body treatments include: contour body wrap, aqua chi ionic foot bath, ear candling, sinus remedy, hand and foot remedies, and body polish. The spa also specializes in waxing. After all that shopping and relaxing you may need a bite to eat! The Beaumont Convention and Visitors Bureau has the best guides for restaurants in the area.